When accepting the Maastricht treaty, the members of the Euro-zone agreed on the establishment of a very independent European Central Bank (ECB). Over the years, however, French political leaders systematically brought forward proposals undermining the ECB’s independence, much to the dismay of their German counterparts. This pattern of political disagreement on central bank independence has again surfaced during the current sovereign debt crisis, and has contributed to the discord amongst the Euro-zone members on the causes and proper solutions to the problems. This article conducts tests of various factors generally expected to influence the preference for central bank independence. It shows that economic explanations are unable to account for the persistent differences amongst European member-states on this issue. 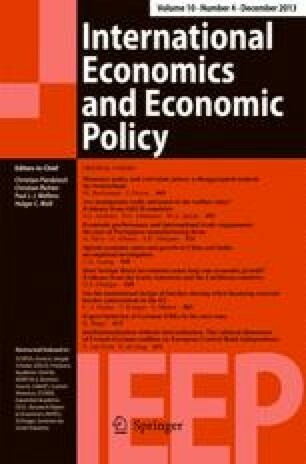 In contrast, national differences in political and economic culture and especially a nation’s score on the dimension Power Distance—its acceptance of centralisation of power in political leaders or institutions—does show a correlation with the different levels of internalisation of the norm of central bank independence. These findings show that institutionalisation of economic norms does not imply their internalisation by the political and the economic elite. In the broader context of current European politics, this may mean that even if European leaders will be able to come up with a common institutional answer to the current crisis, more profound convergence of their underlying economic and political cultures is needed for the successful and sustainable implementation of these solutions. The authors thank Iman van Lelyveld for the data of the Cukierman-index for the period 1990–1997, Sipke Overbeeke for research assistance, and Christian Bogmans for editorial assistance. Extensive comments are acknowledged from Paul Schure, Katrinn Ulrich, Bertjan Verbeek, Amy Verdun, Michiel de Vries, and participants of the ECSA-C conference of May 2004 in Montreal and of the ECPS of March-April 2005 in Durham. The responsibility for the way the information is used is ours. Central bank independence: Masciandaro and Spinelli (1994) for 1990 and Tavelli et al. (1998: 343) for 1997. Government debt as a percentage of GDP in the 1980s: De Haan and Van ‘t Hag (1995, Appendix). Checks and balances in the legislative system. Strong checks and balances: at least two decision bodies exist which are independent of each other, which have different preferences, and each body has veto power. Weak checks and balances: At least two decision bodies exist with different preferences, but one body is decisive while the other can only delay a decision. No checks and balances: there is only one decision body,… or if several exist, they have identical preferences. See Moser (1999: 1580, 1581). Change is the frequency of government changes during the 1980s: De Haan and Van ‘t Hag (1995, Appendix). SIGN is the frequency of government changes when another party comes into power: De Haan and Van ‘t Hag (1995, Appendix). RUA is the Relative Unemployment Aversion, the higher the number the higher (smaller) the aversion for unemployment (inflation), Van Lelyveld (2000, Table 7.1). Power distance: Hofstede (2001) for both Hofstede’s and Hoppe’s measure.